(10-13-03) featured photograph: This picture could have been taken 350 million years ago except for the fallen birch in the background. Equisetum (Horsetail fern) is one of the most common plants in the world today just as it was millions of years ago. Vegetative sprouts of two common species, E. arvense on the left and E. sylvaticum on the right, are pushing through a mat of moss on a birch stump. Large, tree-sized horsetail ferns flourished in the vast swamps of the Carboniferous period 350 million years ago. These primitive vascular plants produce spores on a strobilus, rather than seeds. The first seed producing plants, gymnosperms, dominated the drier landscape 150 million years later, during the time of the dinosaurs. The spore producing habits of early land plants provides a clue to the origin of modern seed plants. 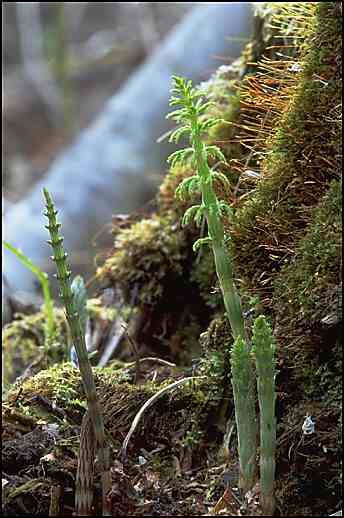 Although many modern pteridophytes have retained the primitive homosporous condition, a significant number of both living and extinct species are heterosporous, that is they produce many small spores that develop into male gametophytes and a few large spores that develop into female plants. According to botanist Karl Niklas, the heterosporous habits of some ancient Devonian (400mya) pteridophytes such as equisetum conferred on them a selective advantage (Niklas 1997, pg 191). Heterosporous plants increase genetic variability in populations by producing tiny wind borne "male" spores that travel long distances and produce male plants that fertilize genetically different female gametophytes. Because modern seed producing plants are all heterosporous, the fossil record helps trace their lineage. Send an email with your own photograph and commentary and I will feature it on this site. It doesn't have to be Alaskan, that's where I happen to live. Anywhere on earth, or beyond, would be welcome.